I hate to gush, I really do, but this stuff is amazing. There are genuinely not enough superlatives invented in English to do this stuff justice. Shu Uemura released their haircare (and hair styling) range of products back in 2008 I believe, but they're really only starting to become mainstream in Irish hair salons of late. 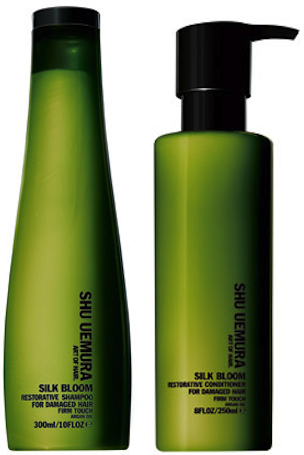 I've been using up a generous plethora of samples given to me by my new hair colourist/salon, where they have recently begun to stock and to use Shu Uemura's Art of Hair range of shampoos, conditioners, treatments, styling products, etc. The Silk Bloom range, the one I've been using, is designed for damaged hair, specifically, which is my hair described to a tee. Naturally black, it's been dyed every shade known to man in the last few years, and my colourist (and my previous, long-standing, now ex-colourist) are both convinced I have some kind of magic hair, because it has no right still "being", let along "being half decent". Half decent is a good description, however, and it is of course damaged, dry and prone to frizziness, and getting it to look good generally takes some effort (about an hour) and expense (tools and products). The shampoo from the range is brilliant. It contains Argan oil (although what doesn't these days!) and vitamin E and is most certainly not an inexpensive product at €30 for 300ml. My hair is quite long (half-way down my back when blow-dried straight. Desperately needing a cut too, but that's another story) and I usually shampoo it three times to make sure I get it all covered, and this shampoo really doesn't lather up a huge amount unless it's applied to absolutely drenched, completely super-saturated hair in order to work it in. This manages to cleanse my hair and make it soft in a way that shampoos haven't done since my teens (ie before I started messing around with perms and hair dyes). And then there is the conditioner. Again, containing Argan oil and vitaman E, I have been putting this in as a masque and leaving it alone to do its thing for about five minutes. At this point I would usually take a wide-toothed comb to my hair to comb the conditioner/masque through, but not so with this stuff, my fingers literally glided through my hair effortlessly; this conditioner literally turned my hair into silk on its first application. And I do mean glided. Not combed. No snagging on any part of it. So amazing it is actually weird. The conditioner is even more gulpingly expensive than the shampoo, costing €40 for 250ml. These products made my hair feel cleansed, soft, lightweight, silky, and not remotely dry. Even letting my hair dry completely naturally, there was a lot less frizz in sight (with no leave-in conditioners or any other finishing or styling products used that day). On the other hand, I did notice that my hair was tending towards greasy after a couple of days (unusual for me; my hair is dry and it doesn't tend to get greasy at all, if anything, with every passing day it tends to get even more dry), and I got one less day out of my hair before I had to wash it. Not a big deal, but definitely different for me (I guess all of the Argan oil at work).